Although best known for his 1990 success with “Dancing At Lughnasa,” Brian Friel’s earlier comedy, “Lovers” is given a very good performance at West End Players Guild. This play was one of the first I saw when my interest in theatre was peaking and it made a very deep impression on me back in the late to mid ’60’s. Friel’s juxtaposition of joyous youth with heartfelt tragedy in the “winners” one-act still has a strong impact on the audience. Combined with the uproarious mischief of “losers” after intermission, one wonders why “Lovers” had been missing from local stages for so long. On a hillock in Ireland, placed in front of the regular stage at WEPG, we meet Mag or Margaret Mary Enright as she bicycles in and hides from her boyfriend, Joe Brennan. These two high schoolers plan to marry (out of necessity as much as love) when their final exams are over in a week or so. The irrepressible Betsy Bowman is perfect as the lovely Irish colleen with her lush, red hair and red-cheeked face that always seems to be smiling. Joe is played with boyish charm by John Lampe. He’s a serious student who has come to the overlook with intentions of studying for the tests while Mag is more interested in planning the wedding, what to name the baby and anything else that will distract her from her books. As the play goes on, they share harsh words, make up and generally do what teen-agers in love so often do. While this happy young couple while away a sunny day in June, two narrators are above them stage left and fill out the story that completes this beautiful setting and the spirited couple who are obviously meant for each other. Steve Callahan and Kristy Wehrle delight with their strong Irish brogues and jolt us into reality as we slip back and forth between the lovers and the narrative that completes their story. It’s a lovely story that takes us on a journey that shows us one of those “you never know” moments shocking in its outcome as it is revealed bit by bit alongside a perfect, idyllic moment captured in time. 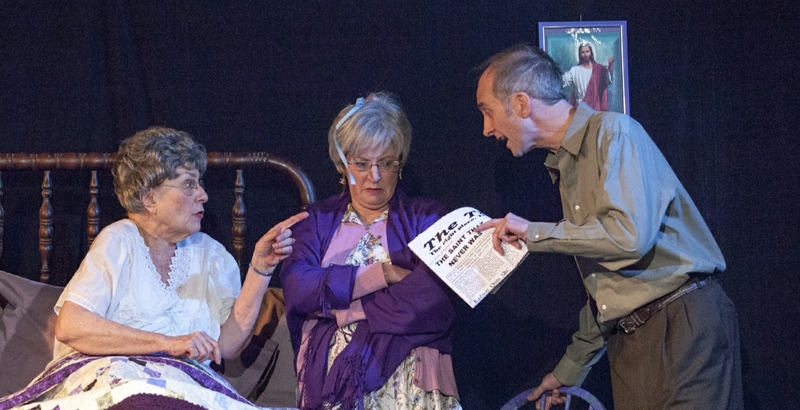 The second act belongs to Colin Nichols as Andy. He is courting Hanna but must contend with her bed-ridden mother who is constantly praying to Saint Philomena and ringing a bell from her upstairs bedroom whenever silence creeps in on the lovers downstairs. In fact, Andy has come up with a solution as he decides to recite the only poem he knows, Thomas Grey’s “Elegy In A Country Churchyard” every time he and Hanna get “busy.” He narrates the one-act as well as portrays the roguish imp and decides he will marry Hannah and take her away from this prison that she’s confined to. Continually bird watching in the garden, he will put down his binoculars and talk to the audience about his dilemma, his plans and even the deus ex machina he believes has fallen into his lap. Theresa Masters is convincing as Hanna as she appears to be fed up with her care taking as well but changes her tune when push comes to shove. The near-hysterical mother is given a pleasantly over the top performance by Suzanne Greenwald. Her need for the rosary nightly at ten and forcing those concerned to kneel around her bed is perfectly played. Adding to the blend is Liz Hopefl as a long-suffering friend of Hanna’s mother, Cissy. In addition, we’re entertained with pre-show and intermission music as well as lead-ins to the plays by Jessie Evans on the button accordion and Sean Belt on the guitar. It adds authenticity and puts everyone in a good mood for the play. Director Jan Meyer has brought every moment of insight, tragedy and pure bedlam out of Brian Friel’s script. Working on the clever set design of Destiny Graham, the play seems larger than life. Tony Anselmo’s lights add to the mix and the appropriate costuming of Renee Sevier-Monsey also brings joy to the proceedings. Nostalgia for me and a great play that happily will allow others to see this rarely seen masterpiece. 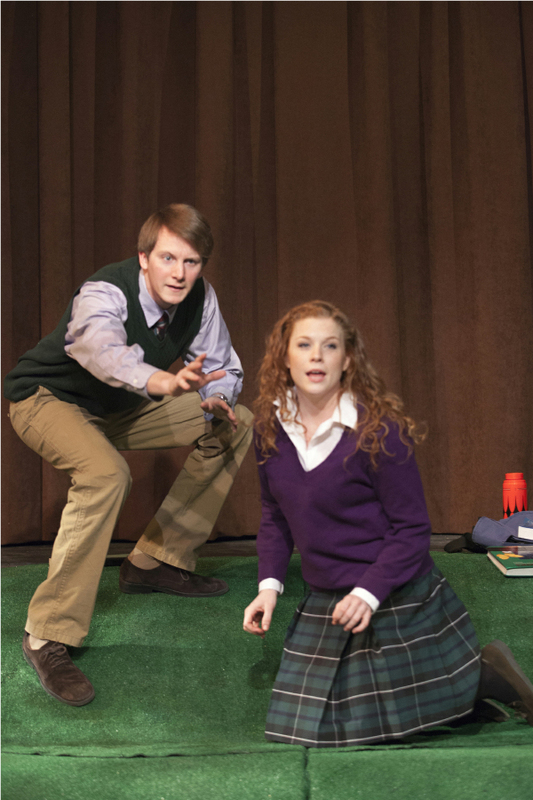 Brian Friel’s “Lovers: Winners and Losers” plays at West End Players Guild through February 23rd. Contact them at westendplayers.org for tickets or more information. This entry was posted on February 17, 2014 at 9:43 pm02 and is filed under Uncategorized. You can follow any responses to this entry through the RSS 2.0 feed. You can leave a response, or trackback from your own site.